The Moroccan parliament and government have joined voices to make it clear that the Kingdom will not stand idly by and that all options remain open for a response to the Polisario militias’ provocative incursions into the buffer zones in the Sahara, in violation of the ceasefire agreements. Morocco’s official reaction to the Polisario’s provocations was expressed on Sunday (April 1), by the Ministers of Foreign Affairs, Nasser Bourita, and of the Interior, Abdelouafi Laftit, at a meeting of the foreign affairs committees of the two chambers of the Parliament. The same stand was voiced at another meeting that gathered the head of government, Saad Eddine El Othmani, and the leaders of the political parties of both the majority and the opposition. A cease-fire agreement was signed in 1991 under the aegis of the UN, and demilitarized zones were created in the Sahara, to avoid any armed confrontation. 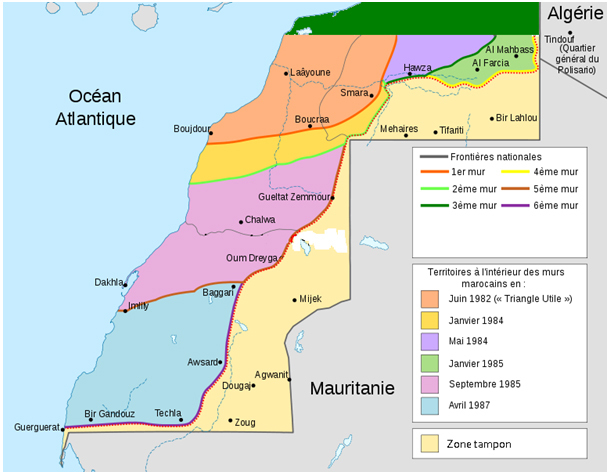 However, the Polisario later on self-proclaimed the buffer zones as “liberated territories” and has regularly dispatched its armed militia there. In a more serious move, the Polisario leadership, encouraged by the Algerian regime and army, revealed recently its plans to transfer its military staff to the demilitarized zones and started mounting tents and military equipment including in Tifariti, Bir Lahlou and Mahbes after the failure of a similar attempt at Guerguerat. After it has been exhausted on the diplomatic battlefield, the Algerian regime is seemingly trying to empty the Tindouf camps, by encouraging the Polisario leadership to transfer the camps populations to the buffer zones. As the serious provocations of the Polisario were faced with passivity on the part of the MINURSO and only timid reactions on the part of the UN and its Security Council, Morocco was not long to react. After it alerted the UN Security Council about the Polisario’s “very serious” incursions into the Sahara buffer zones, Morocco has not ruled out any options, including the military option. For Morocco, it is out of the question to change the status quo in the Sahara, said Foreign Minister Nasser Bourita. “If the UN (…) is not ready to put an end to these provocations, (…) Morocco will assume its responsibilities,” Bourita told the media after the meeting of the parliamentary Foreign relations committees. Morocco will not tolerate any change in this “demilitarized zone” which is under the exclusive control of the United Nations, he insisted.